When life throws you lemons make limoncello! The first time I had limoncello (lee-mohn-CHEH-loh) was years ago in Sorrento, a charming sea town on the Amalfi Coast in Italy known for it’s narrow windy roads, beautiful citrus groves, and well, limoncello. Limoncello is a digestif made from lemon rinds, alcohol, sugar and water. Although it’s made from lemons it’s sweet not sour, since it’s made from the rinds and not the juice. It’s sipped icy cold (but never with ice) after dinner from small glasses. 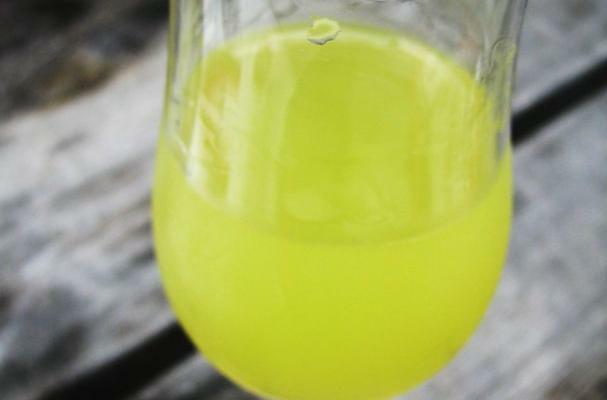 Not only is limoncello delicious, it’s easy and inexpensive to produce, containing only a few simple ingredients and requiring just a bit of time to mature. Perfect for holiday gifts! For a recent update on Limoncello, click here. One day I'll tell you the tale of the first time I tried grappa. Bang, zoom! Limocello is nice, as a small sip or two after dinner- unless you're my mom and sister, who recently polished a whole bottle in a spaghetteria on a recent trip to Italy's south coast. 96 proof vodka is 48% alcohol. If you need pure alcohol, Everclear is close. If not please adjust your word use. Thanks Joe! We adjusted the note for clarification. I got a bit confused..
On step 2 you say "[..] and add the alcohol [..]". On step 3 you say "Add the syrup and the additional bottle of alcohol to the limoncello mixture from Step 2." So, are you supposed to only add one bottle of alcohol in step 2? Besides, when you say "2 bottles minimum 80 proof alcohol", how big bottles do you mean? Just out of curiosity why the additional 10-40 days resting/ferment period after the batching with the sugar/water? I use a recipe from a native Italian for both limoncello and limoncello di crema that calls for the initial 2 week settling with the grain alcohol but once its batched its ok to go ahead and freeze/chill. We researched a large number of recipes and found that a majority have two resting periods, but the length seems to be a matter of debate. The main benefits of length are intensity of flavor and clarity. The disadvantage is that you have to wait to drink it! That's true, it's a matter of taste. You can drink it right after filtration and freezing but it gets smoother the longer it sits. I've found that the first week makes a big difference and after that it seems more subtle to me. Mmmm, sounds good for a hot summers day. Shame we don't get summers in England though.